So it is extremely unlikely that this purge will be the end of this particularly turbulent chapter in the history of the House of Saud. It may just be the beginning. 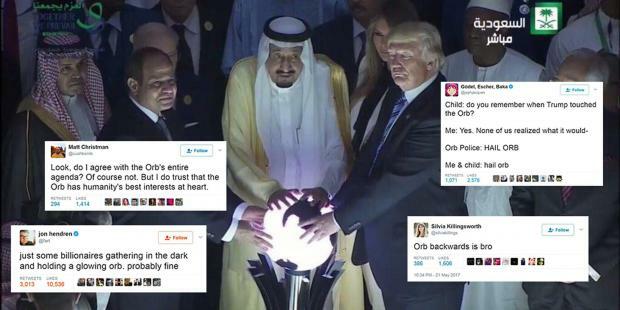 Saudi Arabia, May 2017. A private yacht sails into the port at Jeddah under heavy guard. The yacht's identity is hidden even from the port authorities. Only a handful of people are allowed near it. They deliver several boxes and the yacht sails away. The boxes contained cash. $1 billion cash. A "gift" from the inner circle of Saudi Clown Prince Mohammad bin Salman (MBS). And the mysterious yacht? It belonged to The Trump Organization, and the whole mysterious incident took place while Trump was busy bowing to MBS' father, King Salman. An incredible story, to be sure. Phenomenal, even. Trump bribed by the Saudi Crown Prince to the tune of $1 billion? The beloved POTUS selling out his country in return for some cold hard cash? It could be the scandal of the century, and it seems to explain so much. After all, Trump's genuflections toward the Saudi royals (literal as well as figurative) and his profusions of "great confidence" in those same royals even as they commit a chaotic and bloody purge stand in stark contrast to the rhetoric of candidate Trump. Lest we forget, it was just over one year ago that Trump was railing against Clinton for accepting money from those gay-killing, women-enslaving Saudi fiends and openly ruminating about Saudi connections to 9/11. ...But is it true? Was there really a private yacht in Jeddah Port? A team of shadowy men from MBS' inner circle? The billion dollars in cash? Who knows! The story comes from @mujtahidd, an anonymous Twitter user who has two million followers and claims to have sources close to the royal palace. And, true or not, it's being reported on by "reputable" outlets. And why not? It's salacious. It's tantalizing. And it makes just enough sense to be not entirely implausible. In a sense, the yacht story is a good window into the chaotic "anti-corruption" purge taking place in Saudi Arabia right now, which has so far netted 201 people (and, not incidentally, 1700 bank accounts). There's so much uncertainty from so many quarters that even the most outlandish stories are being taken seriously. Did a Saudi prince die in a shootout while being swept up in the Kingdom's recent purge, as many outlets reported, or is it all a hoax, as Saudi officials claim? Was the dramatic downing of a helicopter during the purge a deliberate act? Heck, was the Vegas shooting actually an attempt to assassinate MBS? Who knows! But don't worry, all is not lost in these chaotic times. There are some things that we do know about what's going on, and as it turns out, these things are pretty important. So let's examine the things we know (or need to know) about the Saudi purge. So guess who was in Riyadh paying an unannounced visit to his good friend MBS just days before the purge madness took place. Go on, guess. If you guessed arch-Zionist Jared Kushner, aka meddler-in-chief of Middle East affairs, aka Mr. Ivanka Trump, then give yourself a cookie! As Politico reported late last month, without any word from the White House, Kushner took a commercial flight to the Kingdom (along with national security adviser Dina Powell and Middle East envoy Jason Greenblatt) and returned before anyone was the wiser. But don't worry, the dutiful lapdog MSM intimated that the sudden, unannounced and completely secret trip was about...peace! Apparently Jared is just so concerned about solving the Israeli-Palestinian conflict that he's apt to jump on a plane at a moment's notice and fly to...Saudi Arabia? And then fly directly back? If that seems even more unbelievable than the Jeddah yacht story, you're right. Remember, this is the same Kushner who was personally responsible for putting together the infamous $110 billion Saudi arms deal earlier this year. And—as I reported in these pages in June—this is the same Kushner who was revealed to be “in almost constant phone and email contact” with Yusef Al Otaiba, the shady UAE Ambassador who was caught helping a neocon think tank run a smear campaign against Qatar. So it's impossible to imagine that Kushner's visit was unconnected to the incredible purge that took place just days later. The only real question is who was giving the briefing and who was being briefed? (Fun speculation: Trump's support for the purge was the price for the billion dollar bribe). Cigarette taxes, rising gas prices and state debt may seem like mundane stuff to most of the world, but it's hard to overestimate how important these types of stories are for the House of Saud. They say that revolutions never happen during periods of prosperity, and Saudi Arabia has proven to be no exception to that rule. Steady funds from the country's plentiful supply of black gold has allowed the ruling royals to essentially buy the support of their population with subsidized gas prices, lavish welfare and 0% income tax. But as the oil price shock of 2014 set in and the country started taking out loans, slashing subsidies and welfare programs, and unveiling austerity budgets, many are now openly pondering whether the House of Saud will be able to keep the lid on the tribal dissent that has long threatened to divide the nation. The events of this past week are one of the ways that this existential crisis is playing out in the faltering oil kingdom, and if oil revenues continue to dry up, this might be just a taste of the chaos we can expect there in the coming months and years. Enter MBS, aka Crown Prince Mohammad bin Salman. He's the grandson of Abdulaziz ibn Saud, founder of the modern Saudi state, and King Salman's surprise decision earlier this year to put him next in line to the throne foreshadowed the turmoil we've seen unfolding over the last week. Selling off bits of the national oil and gas company (the largest company in the world, no less)? Sure, why not! A $500 billion mega-city in the desert? Let's go for it! Granting citizenship to a robot? Just watch us! Hey, maybe we'll even let women drive! Talk about visionary! The epitome of this gee-whiz hype about MBS and the bold new direction he's taking the country in was the Guardian's ridiculous editorialization of the unfolding purge: Saudi arrests show crown prince is a risk-taker with a zeal for reform. Cooler heads, however, have noted that MBS' remarkable rise to King-in-waiting is in fact an ominous sign. This is the same MBS, after all, who presided over the brutal (and so far futile) Saudi war crimes in Yemen. The same MBS who masterminded the failed boycott of Qatar. The same MBS who watched as Iran's influence throughout the region continued to grow despite the Saudi's best efforts. I know you've heard it before but this is Game of Thrones, Saudi edition. Well, OK, to be perfectly honest I've never seen (or read) Game of Thrones. But this is what I imagine it looks like. One of the people who paints the picture most vividly is Pepe Escobar of the Asia Times, who frames these latest machinations as a pre-emptive counter-counter-coup by MBS against the forces who would prefer him not to be next in line to the throne. Forces that happen to include the CIA. The story goes that in 2014 the US was getting ready to use the "Get Into Saudi Arabia Free" card by "exposing" Saudi terror. They were even prepared to oust the royal families of both Saudi Arabia and the UAE, but were dissuaded from doing so on the promise that US-friendly Mohammad bin Nayef would take over Saudi Arabia. Accordingly, King Salman took the unprecedented step of appointing bin Nayef Crown Prince in 2015, a major departure from the line of succession that had held sway until then. But when the CIA blocked a UAE/Saudi attempt to overthrow the emir of Qatar earlier this year, King Salman responded by sweeping bin Nayef aside in favor of MBS. This, as even the New York Times was forced to admit, was no mere change in succession; it was a coup. It wasn't long before rumors started swirling that a counter-coup against MBS was in the works. And so now a counter-counter-coup has taken all of the would-be coup participants out of action in a most spectacular fashion.